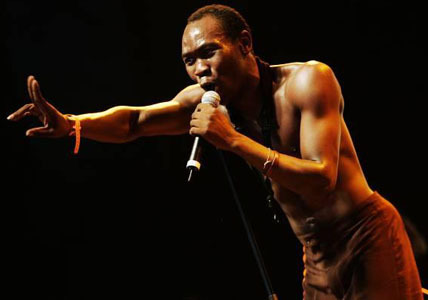 Seun Kuti's From Africa With Fury: Rise, the follow-up to the ferocious Many Things (Tot Au Tard, 2008), is under starter's ordersand Afrobeat Diaries' sneak preview attests that it's a monster, a stone delight of epic proportions. 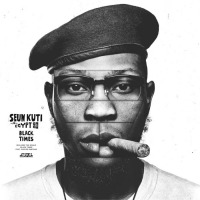 Produced by Brian Eno with John Reynolds and Kuti, with additional input from dub wizard Godwin Logie, the new album features Fela Kuti's son once more fronting Egypt 80 under the leadership of Lekan Animashaun, its founding bandleader, whose time with Fela stretched back to the pioneering years of Afrika 70 and, before that, Koola Lobitos in the mid 1960s. 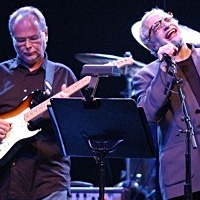 From Africa With Fury: Rise was originally slated for release on Knitting Factory Records in June 2011, but may now be brought forward to April. Watch this space. "I wanted to do something completely different," says Seun. "Not different by trying to be American or European with my sound, just trying to make a very different album from my last album. My last album, it was my first time in control, I was not as confident as in saying what I wanted. This time, I said, 'Okay, I can be more confident in how I express myself, I can say what I want, be as complex as I want.'" Seun is effusive about his co-producers. "Brian Eno is 'Brian Eno' for a reason. He has a great mind when it comes to music. He adds new dimensions to the sound. He showed me new ways of opening up the sound I'd never have thought of on my own. 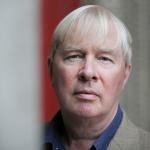 Not to downplay the work of John Reynolds, who is an incredible producer. I'm really glad I had them work on the album." Despite the studio craftsmanship, Seun sees the recording process as a means to an end, a way of capturing his music for posterity. "Afrobeat has to go from stage to studio, not studio to stage," he says. "I don't believe in going into the studio to write songs. You create music in the world, outside, in the environment. You create music with nature, not in the studio. You go to the studio to record, that's it. Music created in the studio is commercial music, music that only wants to sell, that has nothing to do with the world. "What inspires me is the time that I live in," Seun says. "Basically what is happening today in Africa are the same things that were happening 40 years ago, when my father was songwriting, but they're happening in different ways. So when I write my music, it's from the perspective of a 27-year-old man living in 2011, instead of a 30-year-old man living in the 1970s." Despite this, Seun finds himself having to challenge many of the same injustices Fela fought back in the day, from exploitative multi-nationals to militaristic kleptocrats to the futile war on drugs. 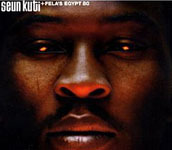 Among the album's unequivocal battle cries is "Rise," in which Seun encourages listeners to fight "the petroleum companies" that "use our oil to destroy our land," "the diamond companies" that "use our brothers as slaves for the stone," and "companies like Monsanto and Halliburton" which "use their food to make my people hungry." 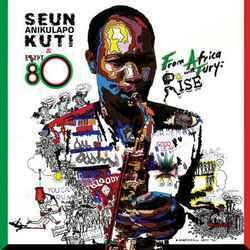 But where Fela's work often featured an explicit call to revolution, Seun's goal is subtler. He sees his role as that of an educator, speaking truth to power in order to provoke debate. "In Africa today, most people are struggling in silence," Seun says. "The systematic oppression of the people has made them blinded to their reality. Everybody's just thinking about survival. Nobody wants to stand up for anything, everybody just wants to tow the line. So I'm trying to make people think about these things that they are forgetting. I want to inspire people to want things to change. "Music has great impact on people's feelings," Seun concludes. "That's what music should be. Pop music today is all about me, me, me. Nobody is singing about we. But nothing can change if we don't look out for our brothers and sisters." From Africa With Fury: Rise will make history. Afrobeat's DNA is intact.